Nothing puts people off having cats more than the idea of having to clean the litter tray every day. For many people the thought is either sickening or it just feels like an unnecessary amount of work. With the recent arrival of automatic cat litter boxes however, having to deal with the hassle of cleaning out litter trays is becoming a thing of the past. These new models are electric and sensory operated so they are able to clear away the cat’s waste and dispose of it in a plastic bag. With most automatic cat litter boxes, the only thing you will need to do is empty the waste compartment once every week and clean out the litter tray every now and then. You will still have to clean the box up a little bit now and then, but it does mean a big come down from having to clean it every single day. Nearly all the models available are quiet and discreet, so then clear away your cat’s litter without making a lot of noise and attracting a lot of attention. Here we compare some of the most popular models of automatic cat litter boxes so then you can find the one that is right for you. The Litter-Robot Automatic Self-Cleaning Litter Box could well present a revolution in the way we take care of our cats from now on. The constant chore of having to scoop out the litter from the tray could be a thing of the past with this litter box that can effectively clean itself. This automatic litter box can detect when your cat has paid a visit and then dump the used litter into a drawer underneath, keeping it clean and your home odour free. A simple yet effective way of having your cat’s used litter cleared away without having to lift a finger. The ScoopFree Self-Cleaning Litter Box is one of the first self-cleaning litter trays that actually seems to offer the complete package. Not only does it take the hassle of cleaning litter out of your hands, but it also comes with a special crystal litter that helps get rid of moisture and odour. For those who don’t want to empty it very often, it also has a tray for the used litter that doesn’t have to be emptied until it has been used for a month. 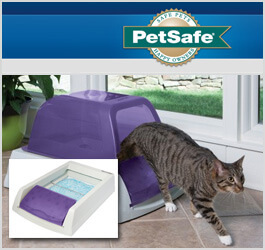 There are not many litter trays available to buy right now that offer this kind of all-round features. 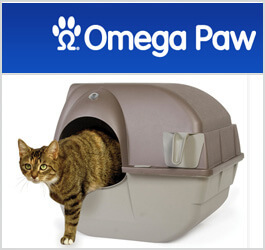 The Omega Paw Self-Cleaning Litter Box is certainly unique when it comes to self-cleaning litter trays for cats. 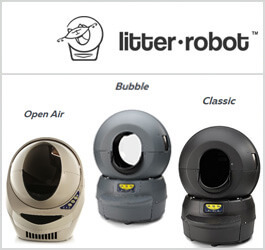 Not only does it take the hassle of scooping litter out of your hands forever, but it also doesn’t require any filters or any kind of electrical power. All you have to do is turn it over and the litter is collected in a nice convenient tray, ready to be emptied. Considering its rather reasonable price, this is probably the most cost effective self-cleaning litter box available on the market right now. 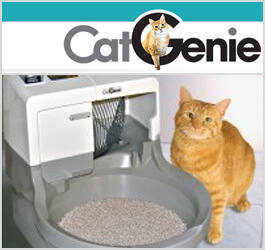 The CatGenie Self Washing Self Flushing Cat Box is certainly one of the front runners on the self-cleaning cat litter front. Not only does it take all the hassle of having to scoop up cat litter out of your hands, but it also represents the closest you will ever come to having an actual toilet in your home just for your cat. All you have to do is set the timer, plug it into your drainage system, and this self-cleaning litter tray will literally flush everything away without you having to lift a finger. 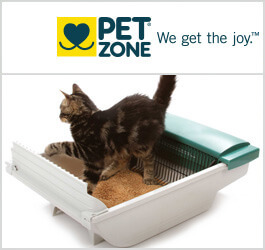 When it comes to self-cleaning litter trays, the Pet Zone Smart Scoop Automatic Litter Box probably presents the best value for money. Once you have bought the tray, you have no need to buy any refills or replacements. All you need is your regular brand of cat litter and plastic bags. It also runs nice and quietly, so it doesn’t disturb you or scare your cat when all the used litter is being cleared away so you don’t have to do it. If you are comfortable with the high price, this litter tray will present great value for money in the future. 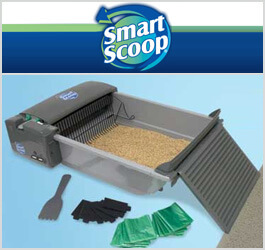 On the surface, there is very little that separates the SmartScoop Automatic Self-Cleaning Litter Box from its competitors. In actual fact, it is discreetly more cost effective than some of the other models on the market. This self-cleaning litter tray comes with six months worth of supplies so then you don’t have to buy any replacement parts for a while. Not only that, but you are still free to use your usual cat litter so then your cat still feels comfortable using your new tray. There are not many self-cleaning cat litter trays available right now that give you the opportunity to save this much money. 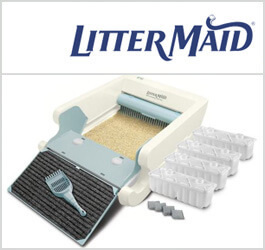 The LitterMaid Classic Self-Cleaning Litter Box is one of the first self-cleaning litter trays that actually seem to take older and larger cats into consideration. The size of the tray means that it is ideal for someone who owns a larger adult cat, or even someone who has several cats that want to be accommodated within a short space of time. To make it even more appealing, this litter tray comes with a helpful paw cleaning ramp, so then your cat can have clean paws at all times, regardless of how often they want to use the litter tray, or how full it is. 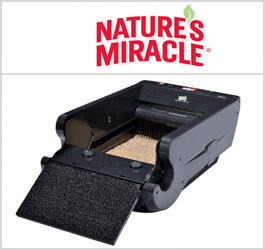 The Nature’s Miracle Single-Cat Self-Cleaning Litter Box is one of the few self-cleaning litter trays available on the market that is actually designed to accommodate just one adult cat. This tray is perfect for anyone with just one cat, as it is nice and compact. This means it can sit discreetly and quietly in the corner of a room, while still giving your cat the pleasure of a comfortable environment for it to do its business comfortably. There are not many self-cleaning litter trays that take into consideration people who own just one adult cat quite like this model does.